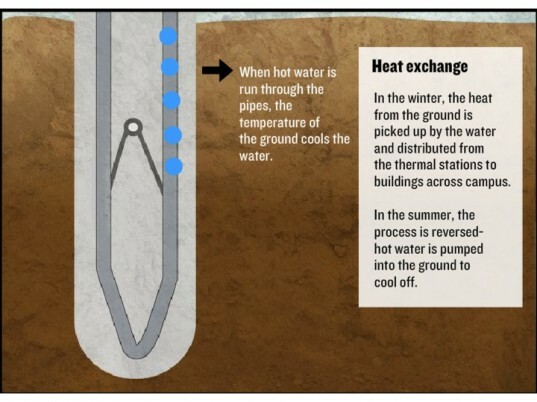 Geothermal power is one of the United States of America’s most readily accepted forms of alternative energy – and now Ball State University is entering the final phase of a massive geothermal system that will be the nation’s largest. The geothermal ground-source heat pump system, which will replace four large coal-fired boilers, will reduce the university’s operating costs by an amazing $2 million per year. The project to replace the university’s outdated heating systems first started in 2009. The new conversion will provide more efficient heating and cooling to the campus, while reducing the school’s carbon footprint by nearly 50%. As part of the conversion, Ball State is installing a vertical, closed-loop district system that uses only fresh water. The newly installed heat pumps will use the Earth as either a heat source, when operating in heating mode, or a heat sink, when operating in cooling mode. The final phase is being undertaken under the direction of Jim Lowe, director of engineering, construction and operations, who will see the installation of 780 of the remaining 1,800 boreholes in a field at the south area of campus. Construction will continue throughout 2013-2014, and the project includes provisions for a new District Energy Station South that will contain two 2,500-ton heat pump chillers and a hot water loop around the south portion of campus. Once operational, the system will be connected to all buildings on campus, providing heating and cooling to 5.5 million square feet of space. “When costs began to escalate for the installation of a new fossil fuel burning boiler, the university began to evaluate other renewable energy options,” Lowe says. “This led to the decision to convert the campus to a more efficient geothermal-based heating and cooling system.” Here’s hoping that other higher educational institutes will see the benefits of lower fuel costs and carbon footprints. Geothermal power is one of the United States of America's most readily accepted forms of alternative energy - and now Ball State University is entering the final phase of a massive geothermal system that will be the nation's largest. The geothermal ground-source heat pump system, which will replace four large coal-fired boilers, will reduce the university's operating costs by an amazing $2 million per year.